There’s a lot to see while walking Tubbs Hill. The surrounding beauty of the lake and mountains alone really makes the walk worthwhile. But what about the trees through which the trail winds? While some trees are nice and green, others are “sick”, dying, deformed, and dead. The following is a narrative, with photos, of a walking tour we took on the afternoon of September 27, 2018. Click on the images to see them larger. On the upper Fire Road there is a great view of the lake and mountains. We also had a view of some “plants” growing on ponderosa pine branches. This is Mistletoe, but not the species we hang over doorways at Christmas. This is a parasitic plant that over time causes “witches brooming”, and slows the tree growth. The female mistletoe plants will develop round seeds (see yellow arrow). The seeds are “jet propelled” away from the female plants due to a high internal liquid pressure when the wind blows this time of year, or when James brushes the plant taking a photo (see video link). The seeds are sticky and when landing on another pine branch below will send a “root” into the inner bark and start growing another mistletoe plant. This often happens on young trees down slope. The mistletoe plant deforms the branches, and young trees likely will not be able to grow up to be a tall well-formed ponderosa pine. Pruning off infected branches on these young trees can give the trees a good chance of developing normally. This could be done by volunteers under the direction of the Park and Recreation Department. Here is a slow-motion video (20% speed) of a parasitic mistletoe seed shooting off the female plant. See the red arrow which shows the path of the seed. This mistletoe is on a Ponderosa Pine tree. We walked to the old turn-around on the Fire Road and took the trail down to the main trail, at the Douglas-fir snag with the East Tubbs trail sign. This snag is a classic cavity nesting bird “condo”. As a general guide, up to ten snags per acre are considered a good number for cavity nesting species. Walking east on the main trail, we come to a group of dead ponderosa pine killed over the last two years by the Western Pine Beetle. 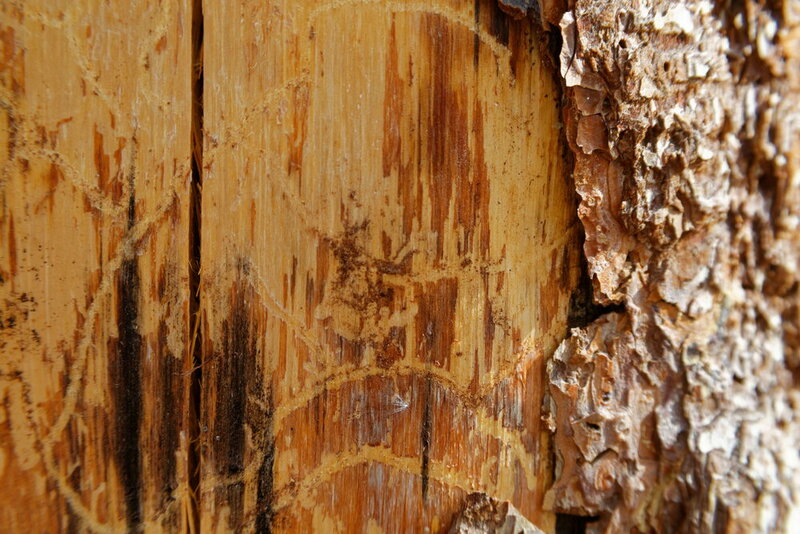 A patch of bark removed shows the track of the beetle underneath the inner bark that girdled the tree. Some of this beetle mortality may occur annually in ponderosa pine on the hill, but so far has not been a serious problem. We continue our walk on the main trail around to the east side, and at the wooden bridge, you can look up the draw and see several Douglas-fir that are “sick”, dying, and dead (see blue arrows, left-to-right). This is Armillaria Root Rot fungus at work. This soil borne fungus “eats” Douglas-fir roots, and most of these trees have overlapping root systems. Armillaria is present and active in all of the Douglas-fir stands on the hill. There is no chemical cure for this root rot. On a positive note, ponderosa pine, western larch and western white pine are very resistant to Armillaria. These resistant species in various combinations have been planted , starting in 2006, and will continue to be, planted by volunteers in the root rot mortality areas. The planting projects are organized by the city, with Tubbs Hill Foundation support. Tubbs Hill was violently scoured some 15 to 12 thousand years ago by the Glacial Lake Missoula Flood episodes and today has shallow, rocky soil. The downfall snags are a significant soil building source on the hill. These dead trees when on the ground provide a valuable source of soil organic matter and nutrients. It takes about the same number of years as the tree’s age to incorporate into the soil. So, a 100 year old tree, once on the ground, takes about 100 years to rot into and become part of the soil mantel. You will also see snags that have been felled by the city that were a threat to public safety. As we walk up the trail toward the swinging bridge we noted some Douglas-fir snags likely killed by the Douglas-fir Bark Beetles. Woodpeckers going after the insect larvae have made the tan color areas on the bark. We continue walking on around to the north side. This is the more moist side of the hill. Over the last 50 years Norway maples had become established, initially by birds, and later by natural seeding as the maples matured. In 2010 these non-native trees were girdled to make room the native white pine, larch and ponderosa pine that were planted in 2011 by volunteers (photos to right). These planted trees will become the dominant natural tree canopy for our great grandchildren to enjoy. Walking back to the 3rd Street entrance, I contemplated Nature’s timeline compared to our daily lives. Perhaps next spring we can do a virtual walk around the hill featuring the flowers.